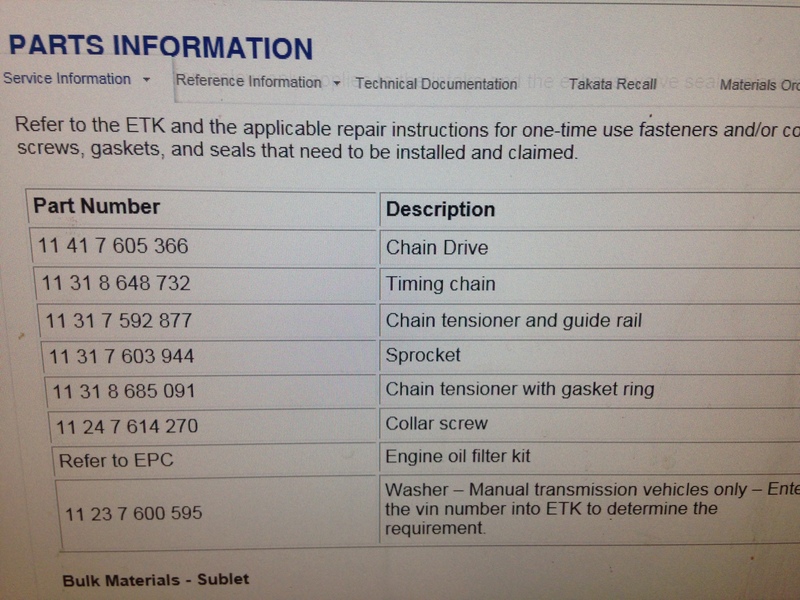 This entry was posted in Uncategorized and tagged list, N20, N26, parts, timing chain. Bookmark the permalink. My n20 I at the dealer now at 30k miles getting all those parts plus a couple more like oil pump and more. I heard a whine through the rpm ranges, dropped my car off, a field service tech replicated the noises only on cold start. Received a phone call they will be replacing it all. Will know more by the end of the week but I would have never known without your page please keep going and thank you. So funny thing they replaced all the parts and they said the noise is still there so they are having a another field engineer or some tech guy look at it along with the puma case i imagine. What could it be ? its a generic question to ask, i know. I have seen the oil pump be the cause. I am having the noise also. BMW dealership said the whine noise is coming from the oil pump and they quoted to replace the pump. Car is out of warranty so on my dime. Is it possible to solely replace the chain in the pump rather than the entire oil pump? Yes you can,,,,you can replace the oil pump separately ,,,,but if you want to replace just the oil pump chain or the timing chain you might as well replace everything because you will have to remove everything to get to the timing chain and oil pump chain anyways.,,,then you are only paying for the parts and some labor. Please keep up the work on here Tech i always check your page to see new things. THANK YOU !!. So the seller dealer had his independent shop look at the vehicle and he agreed that the issues were the timing chain, guide, oil pump, tensioner etc. all was replaced according to seller. Seller drove the car for about 100km with no issues. That’s interesting,,,,it’s possible that the engine is low on oil causing it to no start,,,,,let. me know what they find. An oil change was completed by the seller’s independent as part of the work. Ok heard from the BMW dealership. They are saying the problem is the valvetronic motor failed. After repair, oil change is needed as the engine was sending fuel into the engine and contaminated the oil. The dealer stated that this failure is unrelated to the recent timing chain/oil pump repairs that were completed 3 days earlier. Is this true? i find i hard to believe that this could just occur so soon after the engine work. The valvetronic motor has nothing to do with the timing chain,,,the valvetronic is separate from the timing chain repairs. Would a failed valvetronic cause fuel to enter the engine and mix with the oil? Dealer said this occcurred and an oil change is required. No a valvetronic would not cause fuel flooding,,,the valvetronic operates the valve lift has nothing to do with fuel,,,,sounds like maybe they screwed up and they are trying to cover something up. What could be the cause of the fuel flooding? Could it be related to the timing chain/oil pump repairs? I’m so frustrated. Have had the car for 30 days and already had to replace timing chain, rails, oil pump, tensioner, valvetronic motor and now potentially something else. Car was purchased from a used car dealer but was a 1 owner lease prior to this directly from BMW. I am going broke on this vehicle. The dealer is saying that the flooded engine was caused by the multiple failed start attempts by the dealer to start the car after it was towed there. Can that be the cause of the flooding? Got the car repaired today. Plugs were fuel soaked. They cleaned and dried Plugs. Compression was low. Valvetronic actuator would not move thru full range. Valvetronic sensor and line disconnection faults present. Performed leakdown test. Excessive air leakage present past piston rings. They replaced valvetronic motor and parts changed were actuator and a gasket set. Car drives again. Hopefully this is the end of this nightmare. Does the above sound like they solved the problem? When replacing the timing chain are you lowering the cross-member to remove the oil pan? Is it possible to lift the engine enough to remove the pan without lowering the cross-member on a 2012 328i, manual, rear wheel drive? Are there special tools required to replace timing chain, guides, oil pump, and oil pump chain? Thank you for posting the image of the parts for the N20 timing chain. Just some questions. 1. What is the Chain Drive ? 3. Chain Tensioner and Gasket Ring ? But there seems to be another Chain Tensioner on top ? Also -> 3. Engine Oil Filter Kit – > therefore we also have to drain/replace the engine oil ? 4. Do we have to change the oil pump chain and the oil pump as well ? Ahaa … So the Oil Pump -> We keep ? Just change the Oil Pump Chain ? 6. Sprocket – Lower Timing Chain Area ? XX1. Valve Cover Gasket – Not Needed ? XX2. Oil Pump – Not Needed ? XX3. Water Pump – Not Needed ? Note my F30 328i 2012 is at approx 100k km. Regarding the Oil Pump – What is the lifespan ? I am 100k kilometres …If it fails, is there a warning light ? Will failing of the oil pump be a catastrophic failure too ? I understand that the water pump failure gives a warning message in the dashboard but unsure if we get the same warning for an Oil Pump. Thanks ! There is no reply link … So i am doing it here. Ok will do, but does the crankseal definitely need to come out to do the timing chain,guides and oil pump chain module? Its much of a muchness as Ive ordered the tool kit (which wasn’t cheap) for front and rear crank oil seal as the clutch judders slightly on take off occasionally only and is ok then for a while I’m assuming the rear crank oil seal is weeping slightly so at some point that and the clutch will need changing. I can get this from Russian online websites as there seems to be copies there of it but is this absolutely needed or could I modify something. No sealant on the front crankshaft seal,,,you can replace the drive belt if you want,,,,,is the belt cracked or covered with oil then replace it. You can just use your breaker bar and slide a pipe over the handle to make it longer. Many thanks again for detailed info, great site keep up the work. Its nearly tempting me to buy a new BMW once I save my pennies!Lots of energy around the brand some good and some bad. They have the best style ,interiors and reputation on the road. Do you know what design changes were made to fix the timing chain problem. I know the chain guide material was improved. Was the sprocket improved and if so, how. And of course the chain itself, why is the new chain better? And I assume the new tensioner just pushes harder against the guide? The new chain is stronger then the old one. Hi bmwtechnician – thanks a lot for all your posts and useful information! Were there no part number changes made when BMW issue “better” timing chain, slide rails, sprockets, etc? I noticed that all part numbers for these components that are available for purchase today are the same as originally issued with the engine. I’m looking at doing the usual N20 timing chain, slide rails, tensioner, oil pump chain kit job in my 90K miles, 2012 328i and want to ensure I use the latest and most up to date components available. Thanks in advance. That parts list is all the new updated parts for the job. Great… thanks for the prompt response. If I wanted to change my clutch (manual transmission car) at the same time as replacing the timing and oil pump chains, in your opinion, would I be better off pulling the engine off the car to make both jobs easier? No you are better keeping the engine inside the car and remove the transmission to replace the clutch,,,and it’s easier to keep the engine inside the car to replace the timing chain and oil pump. Checked the chain slop through the oil fill cap and it was pretty loose – assume part of it because the engine was off and there was no oil pressure in the tensioner. Nevertheless got into my engine (2012 N20 – 328i F30 car) expecting to find a stretched chain or broken chain rails. To my surprise, the chain was not stretched (compared to the new part I already purchased) and the rails were intact!! My question is: is there a way to clean the VANOS Adjustment units and the central valve?? I rather not buy new units are they are quite pricey – and seem like a simple enough part that could be cleaned somehow?? Sorry I don’t know of anyway to clean the vanos units,,,maybe someone out there has had success cleaning them. Thanks for posting this. I have a question related to Washer (11237600595). I have N20 with automatic transmission and looking at my invoice I see that I was charged for this part. I know that it costs pennies, but I still don’t like to be overcharged for items that I don’t need. Do you know if there are any cases where it is still needed on automatic transmissions? What is the purpose of this part? That washer is the front crankshaft washer,,,,you have to remove it when doing the timing chain repairs,,,and sometimes when we remove it the washer is damaged,,,,so the tech replaced it while he was doing the repairs . I am sorry, but probably I didn’t explain right. In service bulletin that you posted it is written that this part (11237600595) is for “Manual Transmission vehicles only”. And my car has Automatic Transmission. I hope they didn’t install it somewhere where it shouldn’t be. I searched for a while but couldn’t find a picture of the parts list for the oil pump guides and chain parts? Thanks again for taking the time to post all this and reply to everyone.